Thanks for the enjoyable and informative read and the heads up. I’m thinking that there will be some people trying out Goblins in modern, now that everyone is hyped that they reprinted Piledriver, adding him to the list of great playable goblin finishers. Maybe they will even splash blue to play Day’s Undoing… we’ll see. And Harbinger is just a neat card to supersede Tidebinder Mage (maindecked of course!). 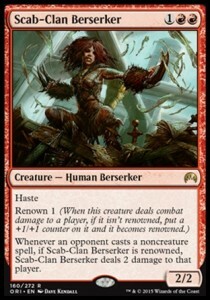 In around 9 out of 10 cases, Harbinger is a better choice, e. g. giving Splinter Twin back their Exarch while destroying the enchantment and also stops a Primeval Titan dealing lethal damage. I’m not in love with buying foils you aren’t planning to play with. It seems like too much could go wrong and tank the price. 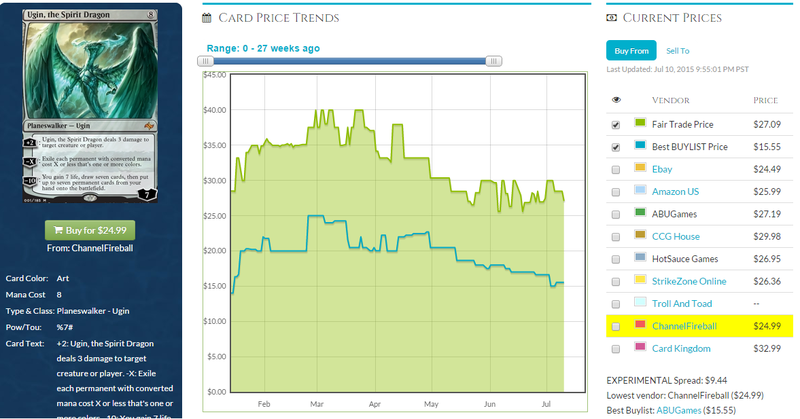 If there is a gradual acceptance of a card then you will see signs that the foil price is due to go up before it does. Let’s see how it’ll work out for me. Richard (from Germany), I humbly disagree with Jim on the topic of foils if you expect them to be played in an Eternal format. I like your 2 targets and the prices you got them at, though I am a little more concerned with the Piledriver spec. Early acquisitions of Tasigur and Collected Company foils paid off huge dividends. Even when Gurmag Angler was in Chapin’s Grixis deck that was a failure (I believe it was a Pro Tour) his foil went up to “only” $2.50 and once the deck was tweeked Angler foils jumped to around $10 and used to be slightly higher. And look at Treasure Cruise foil prices upon release and then with UR delver explosion before the banning. Ditto on Dig pricing except the foil is still around $25 and finally supply is drying up. However, cards like Spirit of the Labyrinth (foils over $20 upon release) and foil Humble Defector ($6-7 upon release) and numerous others are reasons to be cautions. I think it’s one thing to hope and pray a foil makes it into an eternal format like CoCo (which upon release foils were a bit of a gamble), but Harbinger as you said very specifically slots into an established deck and is a solid upgrade to an already existing card. In general I agree with Jim to wait for foils and all card prices from new sets to drop. But as we’ve seen with the communication age sometimes you gotta take a few risks and jump in early cause specs become known quantities very quickly. Hope this makes you feel better about your specs 🙂 Again, be cautious with foils and all cards upon set release like Jim said but if the price is right and you feel strongly enough go for it. 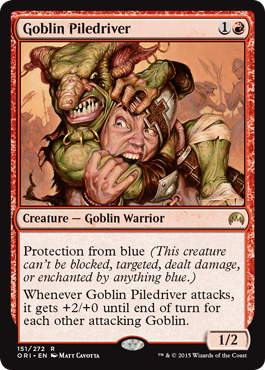 Any foil Rare approaching $20 like Piledriver is a bit risky regardless of the brokenness, cause if it’s that broken it will probably get banned and foil rares going up to $30 is infrequent as well. Very nice analysis! Thanks a lot! Hey Jim, disagreed with you about Richards’ foils but I enjoyed your article. 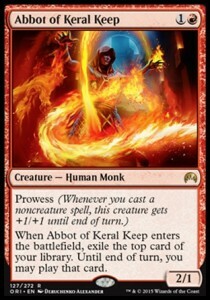 A friend built a mono Red burn type deck for Standard utilizing Swiftspear, Eidolon, new Chandra, and the Scab-clan berserker (Abbot was too slow and didn’t make the main board). In play testing it was amazing, but at a recent SCG IQ he didn’t do well. The Berserker was great in testing but on the draw vs. Coursers, Raptors, morphed Den Protectors, and Siege Rhinos he wasn’t good. Even Caryatid and Satyr Wayfinders were road blocks to the Berserker on the play or draw. I initially loved the spec on him as well, maybe he’s like Eidolon and is better suited for Modern. or when Caryatid and Courser are gone he’ll be able to trade more profitably. So against the Bar Setting deck of Standard in Abzan he wasn’t a success. Against Control, Mardu, and aggro decks he was fine. Oh he also wasn’t good vs Draggon Fodder and Outburst tokens. Flip Chandra was fine vs decks not running Draconic Roar, Ultimate Price, Bile Blight, Dramoka’s Command, and Hero’s Downfall…or Courser, or Rhino, or Sorin (you get the idea lol). Basically my friend and his burn/red deck got obliterated by Abzan. 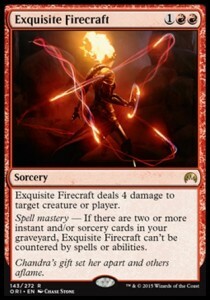 Firecraft isn’t Stoke, it’s just not that good although it might have to be played by certain decks. Only sideboard vs control…3 mana for a Sorcery that deals 4 is pretty bad, even for standard. If Craters’ Claws can’t stay out of the bulk bin and it adds a shock to itself if you have ferocious Firecraft is not going to be $5 (although the supply of the 2 cards will be tremendously different). Plus if casual Red players need it they aren’t going to pay/trade more than $0.50 for the card. $2 max, maybe $1, but I think close to bulk. Oh Infinite Obliteration is a very real card in Abzan sideboards or it should be. In the mirror it’s back breaking. It’s great vs tons of decks if you cast it anywhere in your first 4 turns. And Control has to counter it.